Professor Amit Bahl is a Consultant Clinical Oncologist and Clinical Director based at The Bristol Haematology & Oncology Centre, with a special interest in breast and urological cancers, and he is widely regarded as an internationally renowned expert on all aspects of prostate cancer treatment and can discuss the intricacies of the new modalities of treatment including Proton Therapy. Prior to his current roles, he became a Member of the Royal College of Physicians (UK) and trained in Clinical Oncology, achieving the Fellowship of the Royal College of Radiologists qualification. he has been awarded the fellowship of the Royal College of Physicians. In addition he is a current member of the National Cancer Research Institute Clinical Studies Groups for bladder cancer and chair of the penile cancer subgroup. He has also been a college tutor at the Royal College of Radiologists for 10 years and has supervised several MD theses in breast and prostate cancer research. He has previously been in the NCRI Renal and Prostate clinical studies group, and is an Executive Committee member of the British Uro-oncology group. 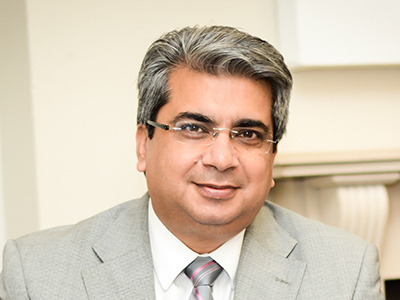 Professor Amit Bahl is actively involved in research into breast, prostate, bladder and penile cancers and has more than 100 publications in these research areas and have several presentations at national and international meetings. In 2012, he was awarded the Cochrane Shanks Jalil Professorship by the Royal College of Radiologists, London and is a Visiting Professor to two international centres and at the University of West of England. Professor Amit Bahl does not hold a share or financial interest in the Rutherford Cancer Centres or another Proton Partners International company. Professor Amit Bahl does not have a share or financial interest in equipment used at the Rutherford Cancer Centres or another Proton Partners International company. Professor Amit Bahl does not hold any paid advisory role(s) at the Rutherford Cancer Centres or on behalf of Rutherford Cancer Centres or Proton Partners International.